Nope. Not talking about the ones with McCoys, but about the restaurant that was on the famed Melrose Avenue in the hey days. I still reminisced from the time that I truly believed it was my first fine dining experience. You just don't what to expect on your time ever. Whether or not you need to dress up. Do I need to be ahead of time to check in for my reservation? How much really do I need to prepare myself on what to order? It's weird about the good ol' days where it seemed a new restaurant or at least the high class ones would opened up on that street in short amount of times. I still had that found memories of needing a scale map to plot it out. Kiddos, it's way before Yelp, Google Map, FourSquare or even Travel Advisor existed to help. Nowadays, there's so much info going on an instant flash, you could hardly keep up with the new news. Even yesterday's news is old news. As you have heard, I have gone incognito for quite awhile. Never realized I didn't do a review of one of my fondest place until it was closed a few years back. 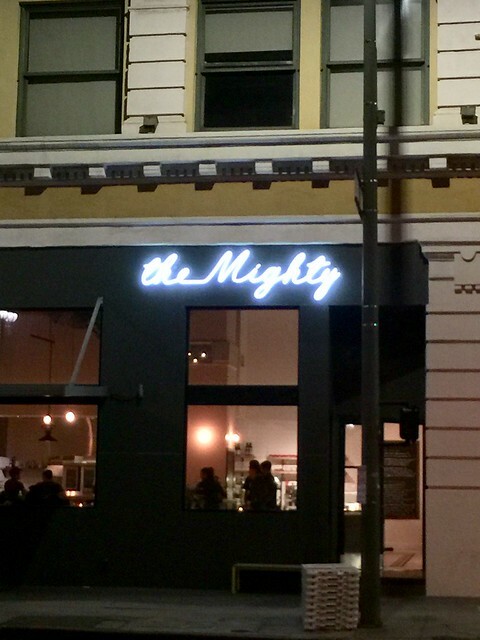 So to my trusty google searched, I was able to find out that the husband and wife team of the namesake Hatfield's opened up a new restaurant in downtown called The Mighty. (although they did opened up Odys + Penelope and The Sycamore Kitchen). 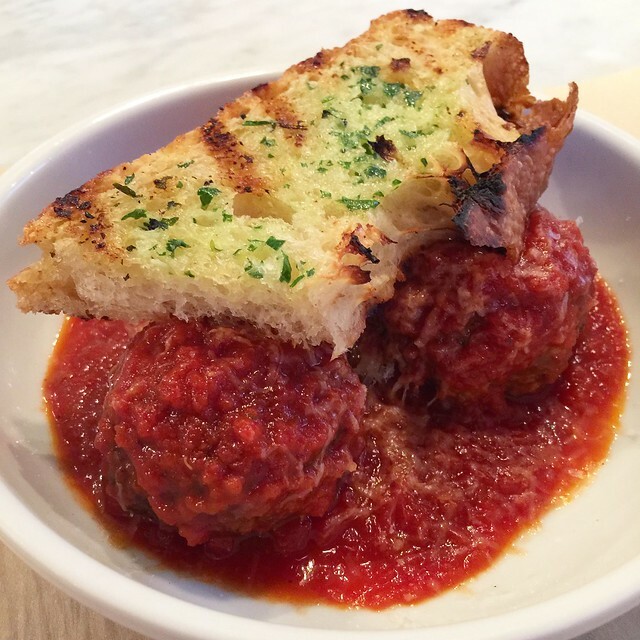 Even by my own standards, it took me awhile to figure out that they just opened sometimes last year in a block away from the beautiful Vibiana wedding venue. Looking at the menu, I was able to figure it out that some subtle differences between Hatfield's and The Mighty. For one thing, it's more casual than fine dining. Whereas in I dealt with tasting menu in my previous dinners, the Mighty has many dishes in a la carte, which I probably preferred. Some of the dishes you can encountered in this restaurant are the elegant plating with the well thought out components for the dish. I always admired the way Chef Quinn Hatfield display some of the creativity in presenting something that sounds simple on the menu, but dazzles you when it comes out. The pasta dishes I am being told is now the big attraction. 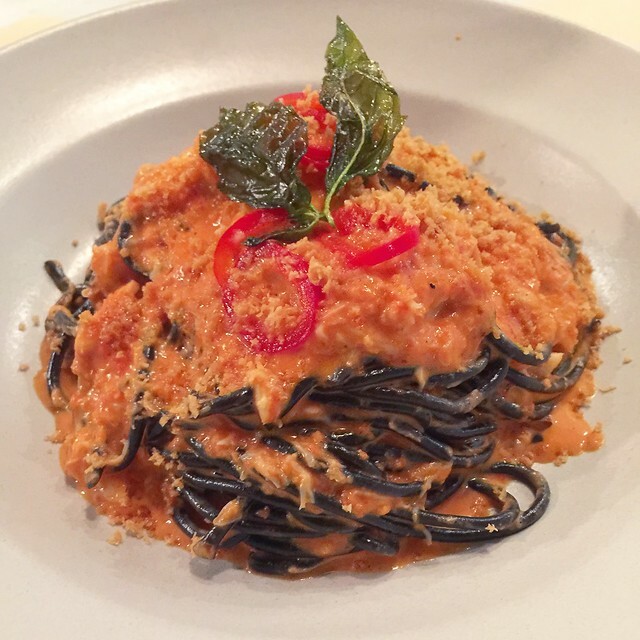 Obviously the squid ink pasta are the ones I needed to order. Instagrammable perhaps? Interestingly, I read a few blog write up where they mentioned this was a breakfast place with pastries and hardy lunch meet up place. Even a brunch place during the weekend. Honestly folks... I don't do lunch, but I might make the exception for the Mighty. 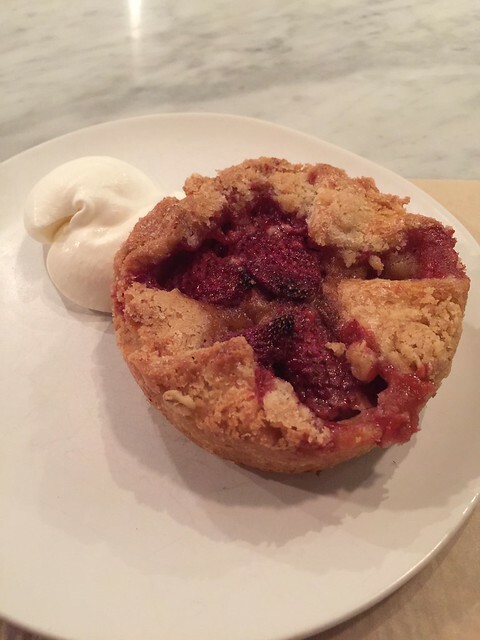 Especially any desserts or pastries coming from the Hatfields. That's another interesting thing, I am trying to get used to in not calling this place "Hatfield's" and start calling it The Mighty. ps: Right after I wrote this, they are limited to daytime hours for breakfast and lunch. Hopefully they bring back dinner service.